Soft and tender egg free yellow paleo cake made with coconut flour. Only 15 minute prep and about 25 minutes to bake with only 8 ingredients! This cake is dairy, nut, and egg free! Top it off with a paleo chocolate frosting, coconut whipped cream, or enjoy it as is! I can’t even tell you how much of an accomplishment it feels like to FINALLY have nailed this egg free + nut free vegan coconut flour cake recipe. No joke. I’m not even exaggerating when I say that I went through at least 10 different variations of this cake before finally getting it right. About halfway through all my testing I had to take a couple weeks off because I was so burnt out on baking cakes. So here’s the thing about coconut flour: it’s notoriously difficult to work with. I go into more detail about the ins & outs of baking with coconut flour in this post here, but the gist of it is that’s just an extremely absorbent flour. You really need a lot of moisture in your ingredients which is why eggs are almost always a key ingredients in many coconut flour baked goods and why it took me so long to deliver on an egg free version of this cake. The base for this recipe comes from my paleo coconut flour cake that I shared a while back. The core ingredients are the same though the amounts themselves do differ by quite a bit: coconut flour, tapioca flour, coconut oil, vanilla etc with the addition of coconut milk for added moisture to replace the eggs. Making the cake itself is pretty easy. The prep time should really only take about 15-20 minutes. It’s mostly just a matter of whisking and combining. That all being said this cake making process will look and feel very different to what you would normally be used to when it comes to baking cakes. Instead of making a batter, this makes more of a dough. It’s thick and pliable and really needs to be handled differently than typical cakes. Start out by mixing the wet and dry ingredients together separately: mix the flours and sugar in one bowl and the oil, milk and vanilla in another. To combine, pour the wet into the dry and mix together with a spoon as much as you can. Once your dough/batter resembles the clumpy dough in the picture above start using your hands to finish mixing. Clump the dough together and scrape down the sides mixing it all together. 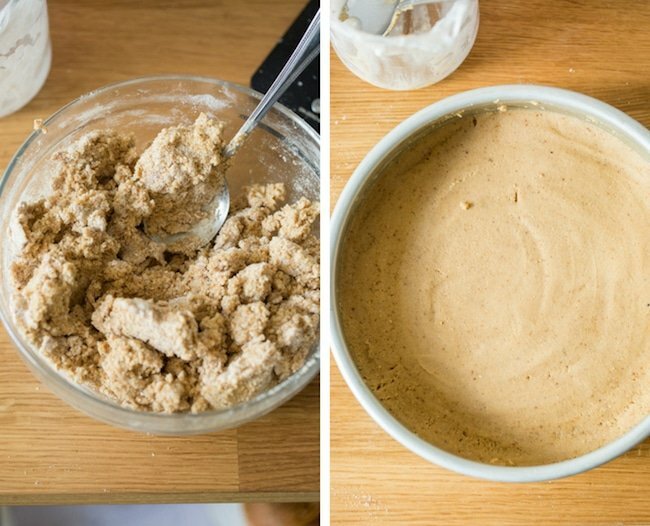 When you’re ready to bake, transfer the dough into your greased cake tin. Since the dough is so thick you’ll need to smooth it out into the pan yourself. It should look and feel very soft at this point like in the second picture just above. Then just pop it in the oven for about 25ish minutes and that’s it! The coconut oil should be melted in a liquid state and cooled to room temperature so that it mixes into the dough easily. The coconut milk should also be room temperature. Ideally you want to use a full fat coconut milk for the extra moisture. If your coconut milk is one that separates the cream from the water just stir it up or shake the can well before using. Don’t be afraid to use your hands to mix the batter/dough together. I personally find it easier than a mixing spoon in this recipe. Since baking soda + apple cider vinegar are the only leavening agents here, keep in mind that this isn’t going to rise up very much. That being said this paleo cake is very soft and tender. I hope you enjoy this cake as much as we do – if you try it out please let me know what you think! 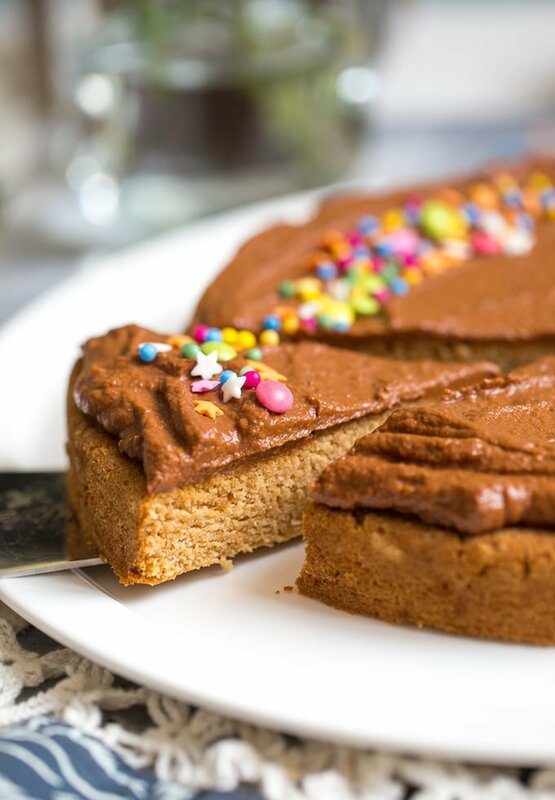 Don’t forget to #asaucykitchen on instagram if you try this Egg Free Coconut Flour Paleo Cake! I love seeing what you make! You can also post your pictures to my facebook page! Soft and tender, egg free yellow paleo cake made with coconut flour. Only 15 minute prep and about 25 minutes to bake with only 8 ingredients! This cake is dairy, nut, and egg free! Top it off with a paleo chocolate frosting, coconut whipped cream, or enjoy it as is! Preheat oven to 350°C/180°C. Lightly grease an 8inch round cake tin and set aside. In a small bowl or mixing cup whisk together the coconut milk, coconut oil, vanilla extract and vinegar until combined. Set aside. In a medium sized mixing bowl whisk together the coconut flour, tapioca flour, coconut sugar and baking soda until no lumps remain. Pour the wet mixture into the dry and stir to combine. The cake batter will be very thick and look more like dough than typical batter. This is easiest to mix using your hands. Once fully combined transfer the batter/dough to your prepared cake tin. Smooth out the dough to the sides and across the bottom in an even layer. Bake for 25-28 minutes. The top will be golden. To check for doneness insert a knife or toothpick into the centre of the cake - if it comes out clean and without any crumbs then it's done. Transfer the cake onto a wire cooling rack and let cool. Make sure it's completely cooled before frosting. Coconut milk & coconut oil should be the same temperature so that they mix together easily. Don't be afraid to use your hands to mix the batter/dough together. I personally find it easier than a mixing spoon in this recipe. 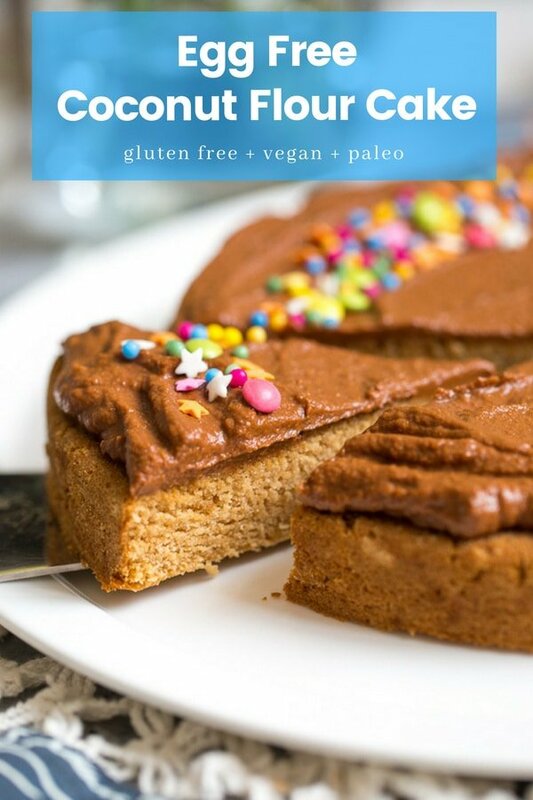 I used my paleo + vegan sweet potato frosting in these pictures (nut free). Unfrosted leftovers can be kept at room temperature in an airtight container. This is best eaten within 2-3 days. If frosted, store in the fridge. I have not tried this cake using any variation of flours/sweeteners so I'm afraid I don't know how to advise on substitutions. Im going to take one respondents success with your incredible recipe and make this chocolate as well! One question, what temperature and how long for two 6″ tins? I followed the recipe exactly and it is delicious!! It tastes like a shortbread cookie. I sprinkled some shredded coconut on too and served with applesauce. Delicious! My 5 year old loves it! I’ll definitely be making this again! Just a note based on the other comments : the batter is indeed very thick and does not have a liquid consistency…it did seem strange at first. I could literally scoop it up with my hands. I packed it into a tin pie plate and literally packed in handfuls of batter , smoothly to keep it even. It did seem a little strange BUT the finishedcake consistency is absolutely moist and wonderful. It is about 1 inch high, so it did not rise. Seriously, don’t worry about looks, the cake is delish! I understand about being scared to work with coconut flour…I just made muffins that were crumbly and bland so I was worried, but this cake came out so soft and moist. Yummy! Yay! So glad to hear you guys enjoyed it – thanks for coming back to let me know what you thought! Hi Sarah! This was a lucky find, as im avoiding eggs ive been trying out different vegan cake recipes as part of building up my skills of baking grain, dairy and egg free. As much as i am annoyed when people want to substitute ingredients that the author has suggested, i did tweak it ever so slightly by adding a pinch of xanthum gum, and and extra Tbsp of tapioca, reducing the coconut flour accordingly. I also baked it in a 7″ pan so it was an acceptable thickness without compromising on the density. I have not iced the cake coz im too lazy once the cake has come out, but feel some sort of apple spice, with currants, would make it a wonderful tea cake. Thanks Sarah for doing all the hard work. I will make this again. Hi Maija! I’m so glad you liked it! Thanks for sharing your adaptions too! I’m sure it will be helpful to someone trying out the recipe somewhere down the line. Love the idea of adding additional spice/currants – that sounds so cozy! Also, how do I get the cake to rise? Looks like it’s quite flat (like the one I tried to make last year, using someone else’s recipe). Is it that coconut flour-based cakes just don’t rise? What exactly do you mean by clump the dough together and scrape the sides. Which sides? I really wish there was a video. Can you be more specific (if you respond to my comment). How long should I ‘mix’ with my hand? When I’m done mixing with my hand, will the dough automatically look like what’s in the pan or will I have to press it in place? I wish there were more details. I tried a coconut flour recipe last year and it was an utter fail. I don’t want to end up wasting ingredients again. Also, I’m thinking of replacing the sugar with date syrup–do you think that would work? I really want to try this recipe. Thank you. Sorry! I should have been clear about the scraping the sides part – I just mean scrape the sides of the bowl to make sure you fully mix in all the flour. I recommend mixing the batter/dough here with your hands because it ends up being very thick since the coconut flour is extremely absorbent. It might make more sense as you make it but when I talk about clumping the dough together I just mean as you mix with your hands that the dough will feel thick and maybe even a little dry. If you try clumping it together (like if you were to form a snowball) it should stick together. You don’t need to mix it with your hands long – just as long as it takes for you to feel like it’s fully mixed. That should be less than a minute. Once mixed, transfer the batter/dough to your cake tin. In the recipe I mention smoothing it out to the sides and across the bottom. Since the batter is very thick and more like dough than typical cake batter you need smooth out and press the dough into the pan yourself. Just use your hands to press and smooth in the cake until it looks like the picture. As for the sugar substitute I can’t really say if it’s going to work with date syrup. I tested this recipe using other types of liquid sweeteners similar to date syrup (honey and maple) and using liquid based sweeteners really changed the overall texture. Based on my experience I don’t recommend it. In regards to how much this cake rises, it does stay pretty flat. If you want to get more of a rise you can use 1 teaspoon baking powder instead of 1 teaspoon baking soda. I only use baking soda here because a lot of the people who were asking me for an egg free coconut flour cake were also avoiding grains and baking powder does usually contain a little bit of cornstarch. 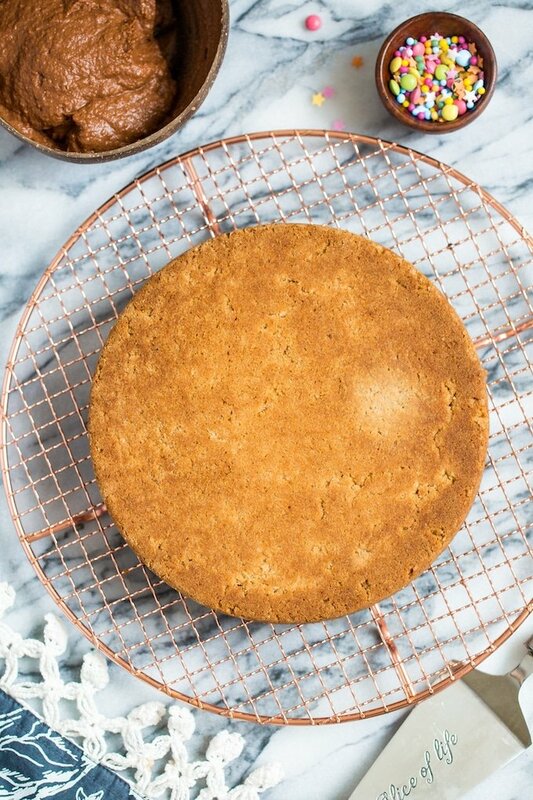 If you’re okay eating eggs you might prefer the egg version of this cake found here: https://www.asaucykitchen.com/coconut-flour-cake/ It’s much easier to work with and it’s final texture is more like a regular grain based cake. Coconut flour can be a really tricky ingredient – especially if you’re also not using regular eggs. I hope that answers your questions but if you need more clarification on anything just let me know and I’ll try my best! I tried this recipe tonight and success! Comments from the table: it tastes coconuty, it’s kind of like a carrot cake. We all enjoyed it. The dough was crumbly when I placed it in the molds so I was concerned it would not come together but it was the perfect moisture. It was hard to tell when it was done, the edges turned golden and crisp but the top never did. I doubled the recipe and made a layer cake with a faux buttercream. I def would make this again, as it was super easy, minimal ingredients and came out delicious. Hi Liz! I’m so glad you stuck with it and enjoyed it! I totally know what you mean about the dough looking really crumbly before baking! Thanks so much for coming back to let me know what you thought! Hello! I made your cake today :). Thank you for giving me a place to start with a wonderful recipe. It doesn’t even take like its coconut flour which is a plus for me! I’m thinking about adjusting the measurements next time so it won’t be so moist but other than that great cake recipe!!! I’m so glad you liked it! Thanks so much for coming back to let me know what you thought! If you do make any changes please come back and share what you did if you don’t mind – I’m sure they would be super helpful! Came out mushy and undercooked. Continued to cook it until the toothpick came out clean but the edges turned hard. Upon cooling, the whole thing was hard and inedible 🙁 Ingredients for this cake were not cheap ($50+ at Whole Foods!) so I was supremely disappointed… Had to throw it out since I couldn’t possibly serve it the way it turned out..
Hi JC! Sorry to hear it didn’t work out for you. How did your dough look before baking if you don’t mind me asking? Was it similar to the step by step pictures I include in the post? Hi Brenda! 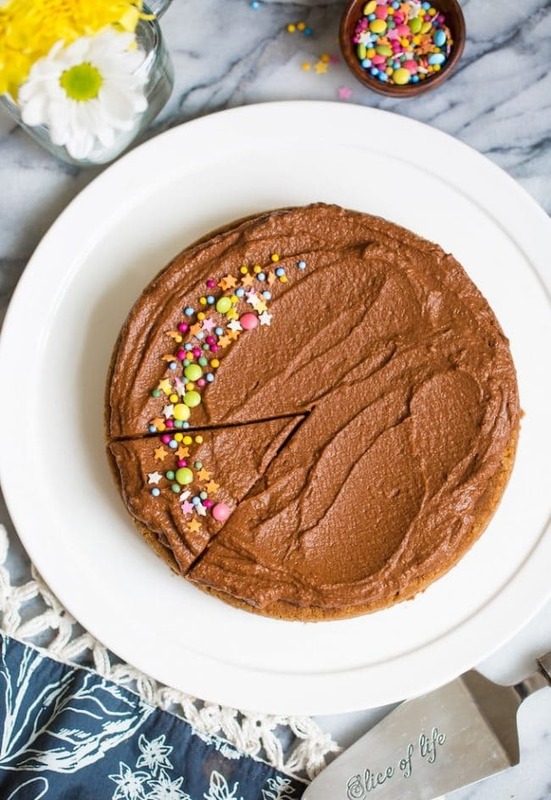 This cake does have coconut sugar which is considered to rank lower than standard white sugar on the glycemic index scale but it is still sugar. I did have someone comment a few weeks ago saying that she made this using 1/2 cup splenda instead of the coconut sugar to make it lower carb and it worked out for her. You can use another sugar substitute here as well so long as it’s something that comes in a crystallised sugar form (not liquid like agave) and it’s meant to be used as a 1:1 substitute. is it possible to replace tapioca flour by almond flour ? Hi Victoria! I’m afraid I can’t say for sure. I’ve had luck swapping out the tapioca for almond in the egg version of this cake and that worked out really well, but I haven’t tried it with this one so I can’t say for sure. I cannot thank you enough for this recipe! I have been vegan for several years, my husband’s best friend is on the keto diet due to having a girlfriend with a gluten allergy, and one of our close friends has a nut allergy. We had a small reception for our wedding yesterday and I had my heart set on a chocolate cake. Imagine my horror when my first attempt was boiling in the oven as it was supposed to be done. I am so glad I found your recipe! I substituted the sugar for 1/2c splenda and 1/4c cocoa powder and the cake came out beautifully. I served it with frosting (1/2c earth balance stick butter, 1c swerve confectioners sugar, 2tbsp cocoa powder) and everyone who tried it told me it was delicious, tasted just like cake, and some compared it to tiramisu. Hi Sonia! First of all, congrats on your wedding! What an exciting time for you! As for the cake – I’m SO happy to hear that you all enjoyed it! Thank you also for sharing how you made it into a chocolate cake. Chocolate cake is next on my list to get right so that’s extremely helpful to know. Thank you so much for coming back to let me know what you thought! This cake looks and sounds so delicious! Can’t wait to try this recipe! Hi Mona! I hope you love it as much as we do!